I love tea- hot tea, iced tea, tea with cream, tea with honey. All tea is good in my eyes! I collect tea cups, tea stashes, enjoy tea parties, and therefore obviously love Alice in Wonderland! 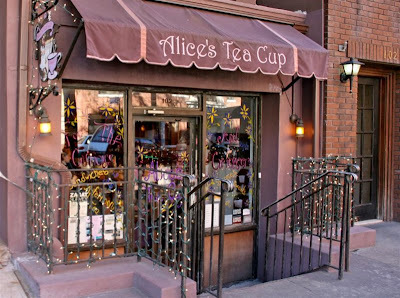 A couple of years ago, as I was in the midst of my favorite pastime of trip planning, I stumbled upon the web site for Alice's Tea Cup in New York. It's this whimsical tea shop (actually, there are 3 chapters sprinkled throughout New York) that sells delicious teas and Alice in Wonderland goodies. They create custom cakes and cater on-site parties, too! I just had to share this little gem with you dear readers! How could I keep it to myself?! Oooooo so glad you posted about this! I am moving to NYC in 2 weeks...this will most indefinitely be on my to-do list. PS: I just shared a cup of chinese yellow tea with my mother this afternoon. Delish! This looks wonderful!! I love tea, all kinds (well, I'm not fond of lapsang souchong! ), and all the goodies that go with tea - all the accessories. This looks a lovely place that I have to add to my list of places to visit! I'm in NYC and I love this place!! Such a good find. Whoa!! I always wanted to OWN something like this. So awesome. How yummy this looks. I love teas, and the whole ritual, especially good if some cupcakes are involved too. oh, how i miss new york city. i used to drop by alice's tea cup back in college... the tea there is good, but the cupcakes... yuuuummmmmm. Hey Jen, just wanted to let you know you won the crystal candy dish. Just let me know where to send it and I'll ship it out on Monday. Wow! I would be in love...I'll keep this in mind if I ever make it out to NYC. :) Thanks for sharing. very cute and quaint little tea shop. no sugar in my tea! Interesting place, I will visit it next spring when I travel to New York. Thanks for sharing. I passed this place when I was in NYC in May, then when I got home from my trip I kept reading about how wonderful it is. I wish I had gone in! My dream tea shop! Thanks so much for sharing this. Thanks, too, for visiting my blog. You are welcome back any time! I go to Alice's almost every week!! I LOVE it!! Looks great! I love Alice and Wonderland too-- have always wanted to throw an Alice in Wonderland styled party! i actually live just a few blocks away from one of these lovely establishments... such a wonderful & whimsical place!